I feel I'm one of the few people around here who seems to not mind bug reports, or even dupes. I'd much rather know all the issues than miss something. For the record, I love bug reports. I even love feature requests. when “subroutine” might be a better, generic word - that encompasses both returning and non-returning procedures. I have a couple of questions about Snap! 1) What would be an example of a “non-returning procedure” in Snap!? 2) Does “ignore” block have anything to do with it? 2.1) Can you give an example of using the “ignore” block in Snap!? Snap!, like Scratch, makes this easy: Command blocks (the ones that look like jigsaw puzzle pieces or Lego blocks) are non-returning. Reporters (including predicates) return (report) a value. although there's really no reason you have to call ANSWER at all. I really like your third example. What about putting it in the IGNORE's contextual Help Tip? Someone has been scared/shocked/surprised by a (computer) mouse in one's kitchen, I guess. Just the other day the Jens' idea to parse poems inspired (on his Facebook) a teacher from China, who parsed one written in Chinese. Then I tried to do similarly with the two poems that I remember from my elementary school. And I must say that the readability of the parsed poem would be improved by your idea. See picture below. I suppose it's for compatibility with Scratch. One can easily build a reporter block in terms of the Scratch ask stack block, after all. In the same way, C++ supports C's stdio.h (as cstdio) and adds iostream, and implementations can define iostream in terms of cstdio. Don't like Scratch 3? 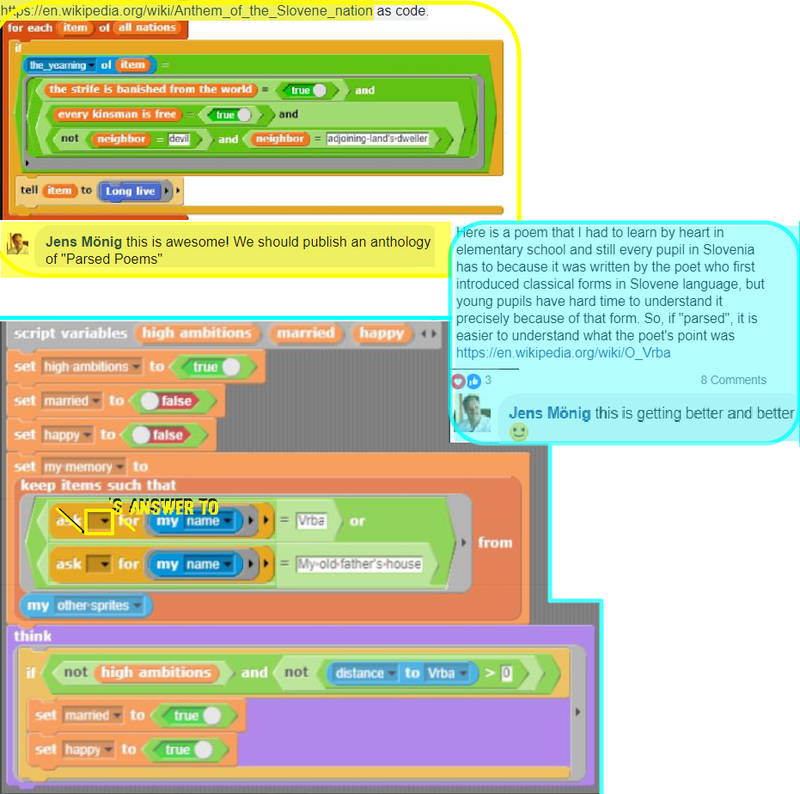 Check out https://scratch.mit.edu/projects/276693738 to see why Snap! might be the replacement for you! Why is the ask function a stack block and not a reporter in snap? In the early days, we felt we had to match Scratch exactly, because we kept hoping we could convince the ST (which basically means convincing Mitchel) to adopt our ideas. We've finally given up on that, although whenever Scratch introduces a cool new feature, Jens immediately wants to copy it. So someday, sooner than “real soon now,” we'll celebrate Flag Day (search it) by introducing lots of Scratch incompatibilities at once, changing the version number in the project files, so when you load an old project we automatically translate your code to a new idiom, maybe loading a Scratch-compatibility library if necessary. One thing I'm eager to change is the Scratch idea that any non-numeric input to an arithmetic operator means zero. (I think it should give an error message.) And change the color space from HSV to HSL. … ASK (sprite) FOR (A NEW CLONE). Wouldn't, in this case, using TELL block be more appropriate than using ASK block? So it would be: TELL (sprite) TO (CREATE A CLONE), I guess. or maybe just ADD (ASK …) TO [clone list]. They don't do it that way in Scratch because they don't have sprites as a first class data type. But we do, and I think it's better pedagogy to encourage people to think of them that way. Current versions of Microsoft Word and Adobe Photoshop can't read really old .doc and .psd files, respectively. Paul's old computer, on its last legs, has versions of those programs just old enough to be able to read the really old files, but to write files in a new enough format for current programs to read. So, the project has two parts. One is to find Word and Photoshop files on Paul's disk. I think I can do that with the Unix “find” and “file” commands in a trivial shell script. The second part is to open each of the files, make a trivial change, and save each one. I'm told that the way to do that is to use Applescript. I have never touched Applescript and don't want to spend tomorrow learning how. Wow! Only an hour or two? You don't give us much time! Once you've used “file” and “find” to make your script which finds all Photoshop files, you can at least compile them into a single archive and back that up onto some other computer. That way 1) you won't lose the files when Paul's computer goes kapoot, and 2) if you somehow manage to break the files via the Applescript you write, you'll have a backup ready. I'm not too sure I can help much with the Applescript side of things, but I'll try a little… You say you need to make a “trivial change” – what exactly does that change look like? Also – this might sound really weird but – do you need the old versions of Word/Photoshop to make that change? If you do, well, then it's high priority, because once Paul's computer passes, you won't have access to the old versions. But if you don't need them, you'll be able to use the backup, and change the files by using another computer. Hopefully it's the latter, because it means we won't need to worry about doing the hard part NOW. s2online: Run Scratch 2.0 in your browser; edit and back up any 1.4 or 2.0 project. HK Scenery: WIP Hollow Knight-inspired adventure project! HK Parallax & Toolbox: I wrote a lot of code to deal with clones! And then I wrote a lot of text discussing it here! Oh, PS, you can probably use a Finder “smart folder” to find the Photoshop/Word files. I don't have a Mac at hand (I've been running Debian/Linux lately), but the basic idea is you do “file -> new smart folder” (or maybe just type something in the Cmd-F search bar…), then set the filter so that it only finds files with the psd/docx/whatever file extension. I think you click a “+” button on the side of the search results to do that. You'll also want to click “On my Mac” instead of “in my ~/Documents” or whatever, so that it finds the type of files you're looking for anywhere on your computer. You say you need to make a “trivial change” – what exactly does that change look like? Sorry I wasn't clear. You change anything in the file and then change it back, so that the program thinks it has to save the file when you tell it to. Like the Unix “touch” command. Word 2 – the intermediate version, on Paul's old computer, which can read Word 1 files and convert them to Word 2 format. P.S. I suppose my estimate of 0.1 N-hr could be way off, but you should feel complimented that I only multiplied by 10 to get you-hours! P.P.S. Sadly, the extensions aren't all correct; don't ask me why. The “file” command looks at the actual data in the file to figure out its type. apple script and those apps are a bad combo. Then find an old VM if you need to, but I'm not sure there's an easy way to automate this, especially if you do need to modify the file or do a save as with a non-default format. It's possible to script but I've never pushed myself hard enough to get it to work. I've found that LibreOffice can open really old Microsoft Word documents, and it does so fairly well. Thanks, we'll try that out!